Baking is science and I don't like formulas, but cooking is art and anything goes...and the simpler the better. It's all about less time at the stove and more time at the table. With a forty year passion for food I'm excited to share what I do in the kitchen nearly every day. If it’s this easy to achieve food bliss why try any harder? 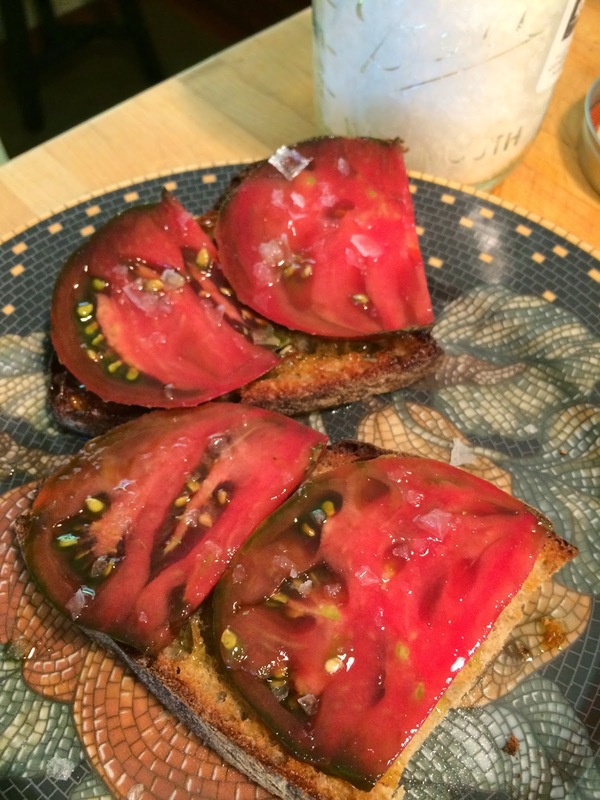 But if you’re going to get there you can’t skimp on the ingredients: Local tomatoes, local artisan bread, extra virgin olive oil, garlic, and flaky Maldon salt. It’s important not to slice your bread too thick, right around a 1/4 inch, then toast on medium. Your tomatoes should be sliced even thinner, about an 1/8th of an inch. Once out of the toaster drizzle your bread with olive oil then cut a garlic clove in half and rub each slice with the exposed side of the clove…like an eraser on a chalk board. After that simply lay on your sliced tomatoes, squish them gently into the bread with the flat side of a chef’s knife, and sprinkle liberally with flaky salt. Chew slowly, they’re only going to be available for a couple more weeks. © Baked Beads, Inc. Powered by Blogger.